If you want to make your next binge-watch a food-fest, Netflix has brought several original food-related programs to the table (as it were), and collected many more from other platforms. Whether your jam (as it were) is travel or competition, documentary or fantasia, instructive or escapist (sometimes all of the above), the streaming giant has plenty to keep you occupied. In fact, it can get a little noisy in there, so we’ve sifted out the best of the best of what’s streaming now. Honorable mentions include Salt Fat Acid Heat, which is not my cup of matcha, personally, but has been favorably reviewed elsewhere, is competently produced, and definitely injects a much-needed female voice into a dude-dominated field; and Mega Food, which ironically suffers from slow pacing but has a unique perspective. If you’ve ever wondered how chefs handle huge-scale cooking gigs (such as catering fashion week in Milan, or directing production of meals for a long flight on a 747), this show offers a peek into what that’s like. As someone who lived in England at a time when “destination dining” wasn’t exactly the first thing you thought of in connection with it, I’m bemused (and pleasantly surprised) to see how many interesting food programs are coming out of the UK right now. And Million Pound Menu gives you a great inside look at how novel food concepts get from a chef’s imagination onto the High Street. Two chefs with big dreams get treated to pop-up spaces to test their ideas with investors who might be able to bring their concepts to life. The contestants don’t compete against each other (which is refreshing); one or both or neither might be made an offer. Or two offers, in which case the venture capitalists are the ones competing. This is the business side of the restaurant world in a format anyone can understand, and the concepts range from down-home grub to ultra-chic farm-to-table haute cuisine. Seeing what it takes to actually open a restaurant will give you a lot of respect for the folks who pull it off, and this show’s format is sleek, easy to follow, and well-crafted. Lab coat and chef’s whites square off in a restaurant kitchen to see whether great cooking really boils down to formulas and knowledge of chemical reactions or whether it’s something that comes from a more ineffable place. It’s an intriguing concept: Cooking is science (as is pretty much everything else), so someone with a background in chemistry should be able to master the harnessing of aromatic and flavor compounds, or leavening, or viscosity or the Maillard reaction… right? And if it’s not that simple, why not? Chef vs. Science pits a chef against a scientist in various challenges to discern whether cooking is really a science or an art (spoiler alert: It’s both). Though the show could go into a lot more depth analyzing the results of the challenges—it’s a pretty big subject; we’re getting into the seriously unquantifiable properties of food, like “soul” and “craft” and “esthetics” and “creativity”—its premise is both fun and instructive, and the results are often quite surprising. It could use a third-party “bridge” to discuss things science can approach better than art and vice versa and what it all means, but even without that layer, it’s super watchable and you’ll probably learn a few things you didn’t know about what makes a tomato a tomato or how protein works. Our food supply system is broken, corrupt, dirty, inhumane, and riddled with fraud. If you are not aware of this, you need to be. If you are, chances are good that Netflix’s new true crime series, Rotten, will contain at least some stories you’re familiar with, and probably a few things you didn’t know. Either way, I’m designating it mandatory viewing for people who buy food in the United States. Produced by Zero Point Zero, the company behind many of Anthony Bourdain’s ventures, Rotten offers a true-crime take on a series of food-industry hijinks, looking at, among other things, the production and consumption of chicken, milk, honey, garlic and seafood. Exposing food frauds ranging from the confusing to the flat-out lethal, the episodes investigate various ways in which the literal food chain is screwed up by the corporate food chain, and the ramifications for people who farm, and people who eat. Which I’m pretty sure includes all of us. Not every episode is wall-to-wall brilliant, but the subject is simply too important to ignore. I prayed long and hard and to no avail for my children to outgrow their obsession with Cupcake Wars, a show I found totally stultifying proof that competition food programming had reached its nadir. Repetitive, limited, middling, devoid of character. So imagine my surprise that a Netflix original knockoff has enough flair and fun in it to actually qualify as one of the better food program options the streaming service is offering right now. Sugar Rush is a baking competition, and it follows the general formula, pitting bakers against each other in a bid to impress a couple of expert judges and a special guest for the chance to win a big cash prize. The tweak to the formula is that contestants are also racing against a clock, and if they can complete challenges ahead of schedule they can bank the time for the final round… assuming they get that far. The contestants are a healthy and sometimes hilarious mix of human ingredients with a vast range of personalities and perspectives, and judge Adriano Zumbo (known in some circles as “Lord Voldecake”) is bright and has a lot of personality. (Cupcake maven Candace Nelson sparkles a bit less but is competent.) And the format is actually rather gripping-much more so than Zumbo’s Just Desserts, which is also available to stream if you just can’t get enough of the guy. There are so many cooking competition shows in the world, and a stunning percentage of them are so rote and mechanized you have to be home with a fever to submit to them. Sugar Rush actually tastes pretty fresh. The Great British Baking Show (or, The Great British Bake-Off in its native UK) is a charming antidote to the competition-cookery style of, say, Food Network. It’s civilized. It’s good-natured. It radiates optimism and positivity. It is… sweet. Twelve home bakers compete over the course of ten weeks until the group is whittled down to a winner. The collegiality of this show is so refreshing and creates an atmosphere in which you’re probably going to be happy for whoever wins. The season-long competition format gives time for the reality show equivalent of a character arc: You’ll get emotionally invested in these people in a way you can’t with shows that start and end in an hour. It’s homey and comforting and you come to feel that you know these people and are on this pastry-quest with them. And that they come to know each other, which is unique and extremely refreshing. No snark. No egomania. Just people who love to bake experiencing the joy and pain of success and failure. Michael Pollan is not a chef, he’s a journalist. And Cooked, based on his book Cooked: A Natural History of Transformation, is a lovely deep-dive into the most fundamental elements of food and our relationship with it. Pollan is a pretty cerebral guy, but his fascination with sensory experience is the real deal—and it comes through loud and clear in the four episodes of this show. Each beautifully filmed installment is based on one of the four elements (air, fire, earth, water) and uses that lens to peer at different aspects of food and cooking, and by extension, culture, politics, anthropology, history and psychology as Pollan tries his own unpractised hand at cooking. I’ve seen an awful lot of snark about “Pollanology” or “Pollanization” (ha ha) or “food-shaming” about pretty much all of his programs and books. Maybe it’s because I’m a Bay Area native, but I honestly don’t get it. He tracks innovations like “applying fire to food” and “vessels that allow cooking in liquid” and how over the arc of history these things have created the diverse and beautiful range of traditional human foodways. Does it get political? Yeah, it arguably does. Does it leave some things unaddressed, like how affluence or poverty play into how we interact with food? In some ways, I suppose he does, but I think we can all assume Michael Pollan is clear on why someone cannot be a hedge fund manager and also spend seven hours a day hand harvesting and milling his own heirloom wheat if he wants bread. I don’t see this show as food-shaming at all. If anything, it’s a bit wistful about the dissonances between wealth and lack and all the other forces that drive people away from truly close connection with the food they eat. And it speculates on whether it’s possible to take any steps back toward a better connection. Personally, I think if you feel shamed by that suggestion, you especially need to watch this show. And for the rest of us? A very well-directed and thoughtful document of food history. Stars: Anthony Bourdain, David Chang, Sean Brock, April Bloomfield, etc. The one thing that’s as much fun to watch as Tony Bourdain might be a show that has Bourdain and David Chang, or Danny Bowien, or Gabrielle Hamilton. Mind of a Chef is a beauty: intelligent, funny, informative and honest. Zero Point Zero Productions perfected this formula with Bourdain’s shows: Chef seeks self and connection to others through travel, cooking, and communing with culinary ancestors and colleagues. There have been countless watered-down versions of this, some vapid, some downright stupid, and some just-OK, but none of them brought the Secret Sauce that was Anthony Bourdain himself. With Tony running the proverbial pass on this show and PBS on board, we get back into the delightful groove of mordant humor and keen self-awareness that always separated Bourdain from his imitators, plus we get to spend a whole season following a different chef on his or her unique-yet-universal journey. Yes, it’s a food show. Yes, it’s a travel show. And yes, it’s a cooking show. But you don’t have to be a foodie to be fascinated by it. Every single one of us has some form of creativity (though some are admittedly more adroit at tapping into it than others) and that germ of creative impulse is one of the things that defines us as human beings. At its core, Mind of a Chef is an exploration of the creative process: what drives it, what feeds it, what comes of it. Stars: Dan Barber, Dominque Crenn, Magnus Nilsson, Enrique Olvera, etc. This show is flat-out beautiful. Each episode is a gorgeously filmed, extremely thoughtful look at one chef, probably but not always at the helm of a hotshot restaurant, and how and why he or she got there. It follows a very standard documentary model: Chef in natural habitat, succulent close-ups of ridiculously pretty food, chef talking about childhood or mentors or philosophy, spliced-in commentary by some kind of expert or family member or cohort. The photography is absolutely beautiful, and the scope is decidedly global and hugely diverse, and it’s intimate, which food should always be. Any one episode is interesting and a joy to look at. 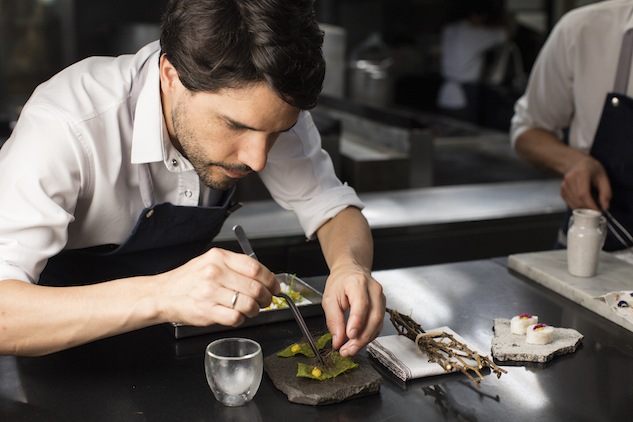 One chef builds ecosystems on his plates, for example concocting dishes to evoke the sea that not only use marine ingredients but are presented to look like a rock that someone pulled out of a tidepool. (They are spectacular.) Another manages to evoke the power of humility and compassion simply by arranging a lotus blossom to float in a bowl of tea. One wants to challenge and provoke; one’s happiest making grilled cheese sandwiches for a clutch of happy regulars on the other side of the bar. All unique. All remarkable. It’s no secret that I am in love with Anthony Bourdain. But even I was a latecomer to Parts Unknown. As a devoted consumer of its two predecessors, A Cook’s Tour and No Reservations, I basically thought there was no more territory for Tony to cover. Where hadn’t he been? How many more times could I possibly be captivated by Istanbul’s telegenic spice market or street-food vendors in Mexico or Vietnam? It didn’t take long before I was eating crow, though. As if in response (perhaps specifically in response) to his scads of imitators, Tony took Parts Unknown to Metaville. This show isn’t just revealing and contemplative and educational: It makes wonderful use of its most abundant ingredient, its host’s carbon-steel-edged self-awareness. While every bit as “for real” as any of his other programs, this one builds on its predecessors like a pastry chef making a tiered cake, with nods to his own past programs, a more expansive array of co-hosts, next-level elbow-ribbing between himself and his crew, and absolutely laugh-out-loud use of mild-mannered wingman-saint Eric Ripert, among others. The posthumous release of the final, 12th season ensured it would also be saturated in a strange valedictory glow, but even had we not lost its acerbic-yet-sensitive creator, it would still radiate curiosity, authenticity and often, hilarity. If you want to understand the difference between a tourist and a traveler, between someone who observes the world and someone who immerses himself in it, between hunger and appetite, between self-consciousness and self-awareness, between existing and living? There’s no better tour guide on television, and it’s entirely possible there never will be.